MedicAnimal is an online supplier of pet healthcare. The company was keen to adopt an online marketing campaign in order to raise brand awareness among pet owners, drive traffic to www.medicanimal.com and encourage instant sales online. Furthermore, MedicAnimal wanted to enable data segmentation in order to assist with future in- house email marketing campaigns. 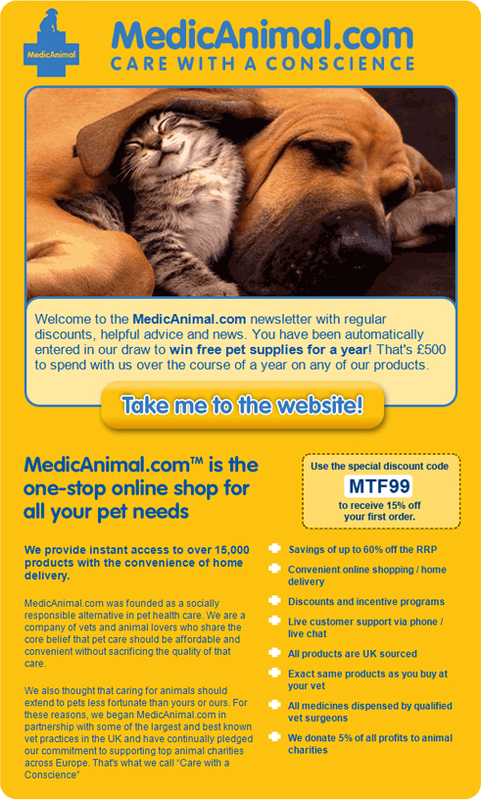 Magnetise Media developed an informative newsletter for pet owners outlining the benefits of MedicAnimal and offering a free prize draw and a discount code for online orders. The campaign was launched across Magnetise Media targeted websites. Once the advert was selected, pet owners speciﬁed which species of animal or animals they had. We then delivered a real-time newsletter containing tailored content related to their responses. Each newsletter included a unique discount code, which was specifically aimed at driving instant sales. Offering consumers with a financial incentive helped boost online sales and the use of a unique code ensured results could be traced in real time. The campaign ran for a nine month period, generating an impressive 10,000 leads. MedicAnimal was happy with the audience reached and the level of engagement. 77% of recipients opened the email and almost a third (31%) used the offer.